Grilled pork tenderloin with salsa roja is the perfect summer grilling dish. I’m taking the pork south of the border by rubbing it with Mexican spices and serving it with grilled salsa roja. Picture the scene. It’s the height of summer, it’s hot out, your friends are over, the grill is fired up, the food is cooking and your 12-pack of Heineken is perfectly chilled. What else is there to do than open one of those nice cold beers to help you cool off and wash down the amazing food you’re about to eat? Nothing pairs better with a cold beer than grilled food and today, we’re not only grilling meat, we’re grilling salsa. What? Yes, we are grilling the vegetables that make up the salsa, but first let’s talk about the meat. The preparation and cooking of the pork tenderloin could not be easier. A combination of delicious spices like cumin, smoked paprika, chili powder and oregano are blended then rubbed all over the tenderloin. It is then refrigerated for up to 4 hours to allow the flavors to penetrate the meat for maximum flavor. The pork is then grilled for about 12 minutes (to an internal temperature of 145 degrees) allowed to rest, then sliced and topped with the salsa. Grilling is all about entertaining and having fun, so don’t forget to crack open a nice cold Heineken while you’re grilling? The cook gets to have fun too, right? Salsa roja, translates to red sauce, it’s just sounds fancy to give it its full name. To give the salsa a delicious smokey flavor, the tomatoes, garlic, onion, jalapeño and even the limes are grilled (you’ll find that grilling the limes makes them so much juicer). This salsa is on the mild side because if the sauce is too spicy, this will overpower the entire dish and take away from the delicious taste of the pork and spices. If you want to make the salsa more spicy, use 2 small serene chiles and include the seeds in the salsa. Because I cook everyday, I shop at my local Kroger store Ralphs everyday and they are my go-to for everything I need. The next time you’re at your local Kroger store don’t forget to pick-up the ingredients for the recipe as well as a Heineken 12-pack for some liquid refreshment, you’ll find it in the refrigerated beer aisle. Need help finding your local store? Heineken can help, just click ‘find Heineken now’ and do a search. If you’re reading a mobile device, click ‘Heineken rebate’ for rebate details when you buy Heineken. Now that I’ve shared with you all my favorite beer and food for summer cookouts, what is your favorite grilling recipe and your favorite beverage to enjoy with it. Grilled pork tenderloin with salsa roja is the perfect summer grilling dish. I'm taking the pork south of the border by rubbing it with Mexican spices and serving it with grilled salsa roja. To a small bowl add the salt, pepper, cumin, paprika, chili powder, onion powder, garlic powder and oregano and mix well. Rub the spice mix all over the tenderloin until it is well covered. Wrap in plastic wrap and refrigerate for 4 hours. Put the wrapped garlic, tomatoes onion, jalapeño (whole) and lime halves (flesh side down) until they are charred on all sides. Add the pork tenderloin to the grill and cook for 6 minutes on first side. Turn and cook for a further 6 minutes or until internal temperature reaches 140 degrees F on a meat thermometer. Remove immediately, cover with foil and rest for 10 minutes and the temperature reaches 145 degrees F.
When the vegetables are done, peel the garlic, remove the stem of the jalapeño and all the vegetables to a blender along with the cilantro.. Squeeze the juice out of the limes and add salt and pepper. Blend until it is the consistency of salsa. Once the pork is rested and at the right temperature, slice and serve warm topped with the salsa. 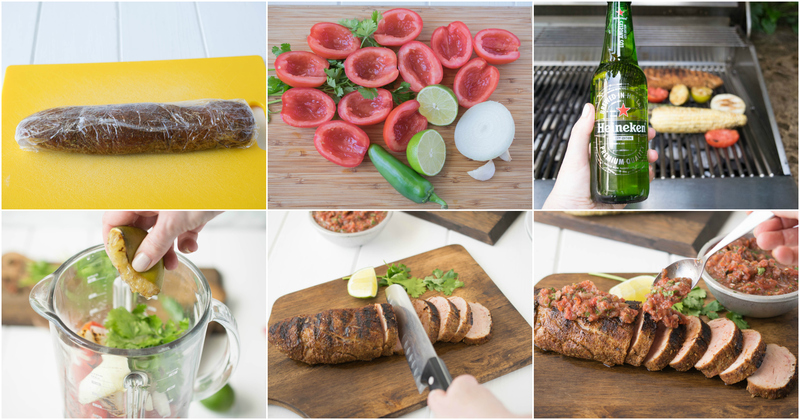 Love a simple grilled pork tenderloin but even more so love that Heineken!! It is a great beer!! What time does that party start? Boy that tenderloin looks great and that cold brew goes just perfectly with that meal!! Stopping by from #FoodieFriDIY to say thank you for linking up! Have a great weekend!